Dave Ramsey when you don’t have money. Dave Ramsey. Paying off debt. Living on a budget. Living on a budget when you don’t have money. Financial freedom. Have any of those phrases ever left you feeling depressed, not good enough, that accomplishing them would be reaching for the impossible? Have you ever thought being debt free and having money in savings was something only the rich could accomplish but for the poor or lower middle class it’s just something to scoff at? I want to encourage you. No matter what your financial status, no matter the decisions you’ve made or what life has thrown at you in the past, you can make forward progress. No, it won’t be easy. Yes, it might be uncomfortable. Yes, you might have to make even more sacrifices. Yes, it might feel impossible. You will most likely be living against the grain. There’s the chance your friends and family will think you are crazy. There’s also the chance some of your family and friends will be your biggest cheerleaders. This is crucially important – and can be done no matter how much money you have. Budgeting when you don’t have money is so necessary. Tell every dollar you have exactly where to go. Yes, that means saying no to a lot of things. 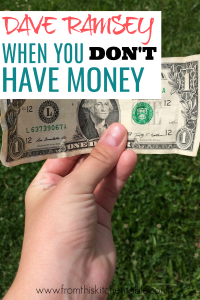 Find ways to lower your grocery budget (a huge passion of mine), vacations might have to take place close to home, clothes will probably be bought on clearance or at garage sales. These are all things that helped us on our debt free journey. After you have a budget, you need to have an emergency fund. This helps keep you from going backwards when life happens. And we know life happens. Save up in increments of $10, $50, $100. Every little bit will add up. You might not have the extra money in your budget to put toward an emergency fund. Your finances might be so tight that even with budgeting and buying used clothes and not eating out, there’s not even $5 left at the end of the month. What then? You are discouraged. Your emotions want to take over and you just want to quit. Think outside the box. See if there is anything in your house you can sell – on Craigslist, Facebook, eBay etc. You might need to sell the car you are making payments on. Look at your housing arrangements. Maybe renting a smaller place for a period of time will help you get ahead. Maybe you have the bare minimum and there’s nothing to sell. Sometimes we have income problems and not a budget problem. All the corners are cut, we are telling every dollar where to go, our cars are old, homes are basic with no modern updates. Look for ways to bring in some extra money. That might mean getting a second job. If you’ve listened to Dave Ramsey I’m sure delivering pizza has crossed your mind. Or maybe you can babysit or pick up a friend’s kid from school. What are you gifted at? Can you sew? Try mending clothes. If you are gifted in the kitchen, maybe you could sell your famous cinnamon rolls. Churches sometimes pay for a pianist or you could give music lessons. Looking for a part time weekend or evening job is another option. To help with buying birthday presents or other Amazon.com purchases use Swagbucks. Look hard at each of your expenses and find ways to save. Check out that post and the ones I linked to earlier for some inspiration. Put that money toward your emergency fund. One of the easiest ways to start cutting costs is on your grocery bill! 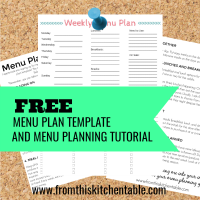 Be sure to get this free menu planning template to make your life easier and save money. Your emergency fund is built up, now what? 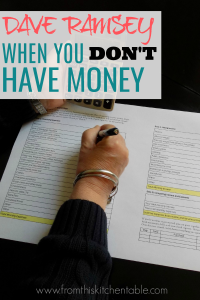 Now you get to apply the money you’ve found by budgeting, cutting expenses, and increasing your income to your money into your debt snowball. Only stopping if you depleted your emergency fund and need to rebuild it. It might take years but keep at it. Keep finding ways to save and trying different ways to increase your income and earn little bits of money each month. It probably won’t be easy, but the rewards later are worth it. Remember, hard doesn’t mean bad. Make sacrifices and think outside the box. Start making baby steps to financial freedom. Even when life throws a curve ball, stay in the game and stay on course. Let the challenges bring you together as a family. Find ways to celebrate and enjoy life even while you are on a budget. These years might be hard and long, but it will be worth it later. Trust me. I’ve been there. When we got married my husband wasn’t making much and I was finishing college and working part time waiting tables. We argued, we did lots of discussing, we worked hard, we said no, we set goals, we celebrated milestones. 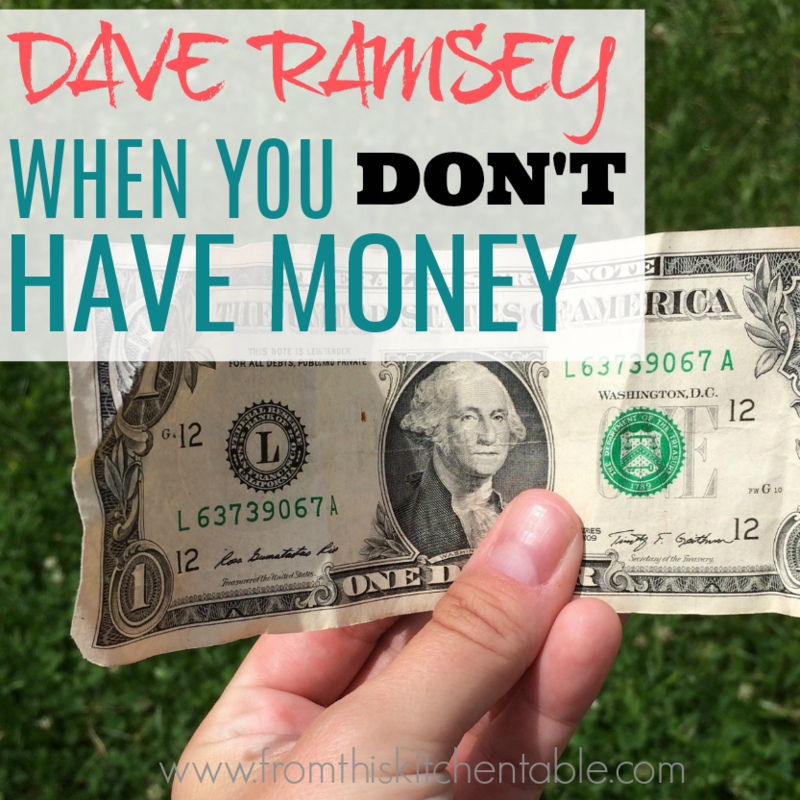 You can do it – you can do Dave Ramsey when you don’t have money! If there’s no one else cheering you on, know that I’m am rooting for you! This entry was posted in Uncategorized on June 5, 2018 by Deanna Michaels. All of these tips are so helpful. 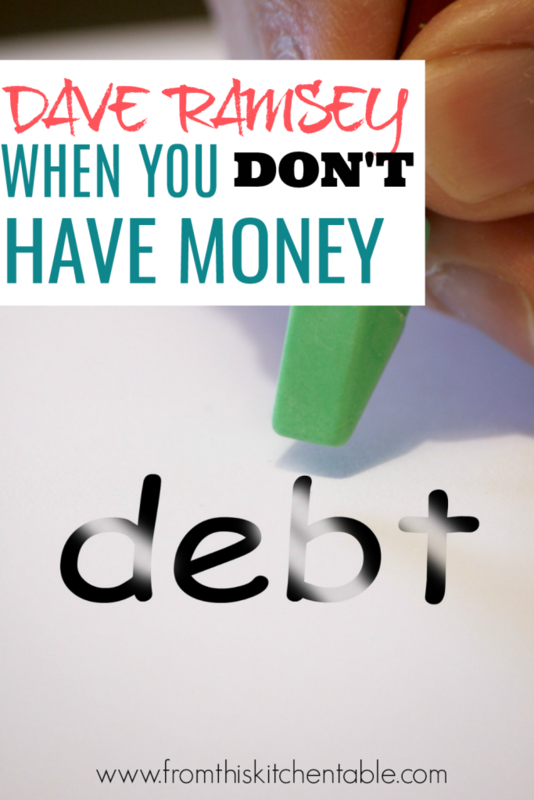 It’s can be so hard to stay focused on getting our of debt. But it will be so worth it. For us when we started having a month budget it helped us stay focused and on the same page with our goals. Yes, you will be so excited when you are debt free! Goodness, isn’t a budget key? It really helps a ton! Very helpful tips! I love the reminder that hard doesn’t mean bad! Great tips. I see so many people who have absolutely no Emergency Fund. When calamity strikes, which it will, it completely wipes them out. Every dollar of emergency fun is one more bit of financial protection. Thanks, Sarah! 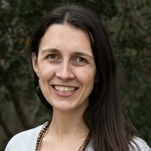 I agree, emergency fund is so, so important! Thanks for stopping by.